It is that time of year again that I have referred to previously as the “fall doldrums” of bird watching. For the most part the summer residents and transients are gone south and the winter residents have not arrived yet. What is left are the year round residents such as the House Sparrow, Chickadee, Downy Woodpecker and a few others. To date we have one transient, the Junco, and one summer resident, the Siskin, in our yard. By the time this gets into print they will probably be gone. This is also the time of year when most people who like birds put out feeders of some sort. It definitely is a good time to do it. In the summer food is plentiful, but in the winter it is scarcer and much more effort must be expended in search of it. Feeders help tremendously, especially in a stretch of extremely bad weather. Farm people usually see more and a greater variety of birds than do town folk simply because farms are far apart and birds are more or less restricted to one farmstead. In town many people put out feeders so the birds can quickly fly from one residence to another in search of what they like best. Even so, there are still plenty of birds to go around for town folk, especially if “desirable” bird food is put out. For feeding purposes, birds can be divided into five categories: seed eaters, insect eaters, fruit eaters, meat eaters and nectar eaters. It should be kept in mind that there is some cross over in many of the categories. Insect eating birds are the easiest to attract to one’s yard while meat eating birds are the most difficult if not impossible. In the coming weeks I intend to deal extensively with different kinds of feeders, feed/food, plantings and location of each in one’s yard. This week’s photo, taken on a dreary winter day, is of a bird that is very easily attracted to a backyard feeder – the Downy Woodpecker. The Downy gets it name from the soft white feathers along the sides of its lower back – a feature that is of no use for identification. 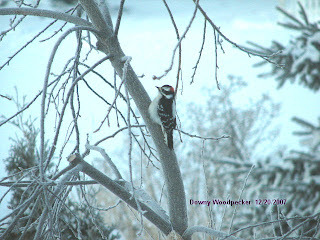 For a more detailed discussion of the Downy Woodpecker and its larger cousin, the Hairy Woodpecker, refer to article No. 27. Both of the woodpeckers have been in our yard already, so be on the lookout for them to be in yours.